Coming to the exhaust on my small to big block swap now. All the while had decided on the underfloor rear exit look, mainly because that’s how my car was originally built, no chance of passengers inadvertently getting burns and no requirement for alterations to alloy bodywork required although routing is tougher. However, I really like the sidepipe look in both chrome and matt and think it’s part of the ultimate Cobra vision. And to make things worse have been offered a perfectly formed sidepipe set in chrome at a great price. Dunno which way to go. Anybody fitted an underfloor system and reverted to sidepipes? Real life opinions appreciated. I'd like one under floor but have no room under my low florred monoque VSE. I'd prefer less noise too. I'd have to run it in the driveshaft tunnel and I don't think there is room with that large winters diff. Have underfloor exhausts with exits just in front of the rear tires (tyres? LOL) for 16 or 17 years. I've had probably 400-500 passengers over that time of all ages and differing physical abilities with ZERO snakebite. That's my reason and I'm stickin' to it! I went the other way....sold the SC Replica with side pipes ….bought a street model with undercar exhaust....no roll bar ...no hood scoop....no stripes....very happy with my choice.. Agreed! I am fascinated by the under car look but like the side pipes too. Spintech and others have oval piping available if you'd like some. 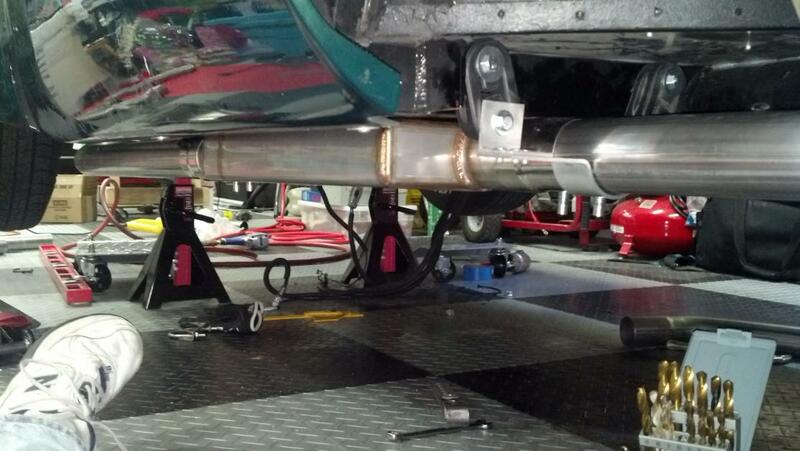 The thickness of the mufflers was kind of the governing dimension for me. Notching the outriggers on the frame was the most helpful thing I found. Bird that GT 40 dream just didn't work out. I am in my 80th year and it was nearly impossible for me to get in and even worse to get out of it....and I could not see anything that wasn't in front of me.....not prudent. It is much much easier to get in and out of the roadster with no top and the vision is excellent for 360 degrees. I found out later that people who are lucky enough to own both drive the roadster more often. I am very happy with my street model. You gotta be able to get in and out and see for sure! 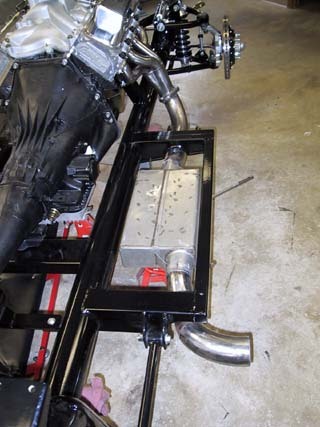 Running sidepipes will be a commitment as you will need to cut holes in the body. You could always consider the 289 FIA style which is a 3" running under the rocker exiting in front of the tire. You can tuck it under the body, or nudge them out about half way to get the best of both worlds. Both configurations are correct. This way you can always swap out, as it is a simple change at the primaries. I think it's the best of both worlds. I had underfloor, rear exit and changed to underfloor, front of rear tire exit. I'm not proficient at posting pictures but PM if you would like a picture. 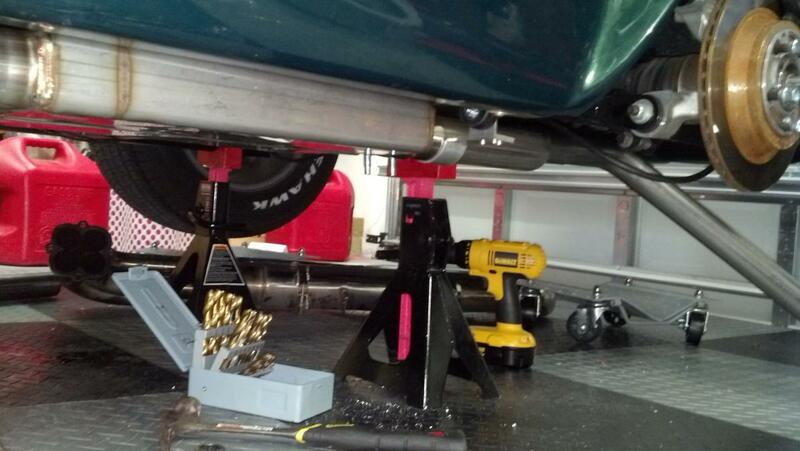 Spintech makes a 3 inch thick muffler with 2-1/2 inch inlet/outlets that works very well and sounds good. Hard to find a muffler less than 4 inches thick.